According to the USDA, Maryland’s program access index – a measurement of how well states are reaching eligible people – was about 94 percent in 2017. The high numbers earned the state a $1.1 million performance bonus for the food supplement program. ANNAPOLIS, Md. — Earlier this year, the Light House emergency shelter in Annapolis, Maryland, was seeing about 200 pickups from its food pantry per month. So far this month, it’s averaging 900. In Maryland, about 10 percent of households are food insecure, meaning they struggle to afford adequate nutritious food, according to data from the United States Department of Agriculture. Those numbers align with anti-hunger program participation, with about 11 percent of the state’s population, more than 680,000 Marylanders, enrolled in the state’s Food Supplement Program — also part of the national Supplemental Nutrition Assistance Program formerly known as food stamps, according to the U.S. Department of Agriculture. The program provides funds to eligible low-income individuals and families to ensure they can afford adequate meals. Representatives from government agencies, anti-hunger organizations and others came together in Annapolis Oct. 9 for a Fighting Hunger in Maryland conference. The eighth annual conference, hosted by the Maryland Food Access and Nutrition Network, featured speakers and panels addressing current issues and best practices in combating food insecurity. “Meals do matter,” said Pat Dombroski, regional administrator of the United States Department of Agriculture. Dombroski said Maryland is a model state when it comes to coordination among federal, state and local programs. Maryland is among the leaders in part because of its free and reduced breakfast and lunch programs in schools, Dombroski said. According to the USDA, Maryland’s program access index – a measurement of how well states are reaching eligible people – was about 94 percent in 2017. The high numbers earned the state a $1.1 million performance bonus for the food supplement program, Dombroski said. Dombroski said successful, locally coordinated efforts include connecting food supplement beneficiaries with local farmers and farmer’s markets. In Annapolis, this local coordination is happening in shelters like Light House. Founded more than 25 years ago, Light House is what volunteers like to call an “empowerment shelter” that provides transitional housing for individuals and families as well as counseling services, facility maintenance training and a unique culinary training program. Vogler said the shelter acts as a food pantry for many low-income residents, too, serving bagged lunches and hot meals daily, and pantry food bags once a month. The demands for food and shelter continue to rise, even with the 24,000-square-foot facility they opened in 2010. “We have five apartments for families and, unfortunately, there’s a very long waiting list for that,” Vogler said. On top of that, she said, the average number of daily lunches given out has jumped from about 40 to 77 in a matter of a few months. Vogler said Light House doesn’t ask visitors about their financial circumstances because they want anyone who needs help to come without worrying about their safety, status or any judgment. She added that they do track who’s picking up the monthly pantry bags in order to maintain inventory and for grants, but they like to remain non-intrusive, so it’s difficult to track the root cause of the recent increase. Light House is able to keep up with the increases with community partnerships and food sharing programs. Vogler said they receive food donations and volunteers from grocery stores, restaurants, and faith groups, including Whole Foods, Fresh Market and St. Mary’s Catholic Church in Annapolis. The issue with food insecurity is that it doesn’t stem from one source, experts said. Michael Wilson, director of Maryland Hunger Solutions and co-chair of the Maryland Food Access and Nutrition Network, said poverty is the main problem, but with that comes concerns about food deserts – typically low-income areas where supermarkets and access to nutritious food are not readily available – a lack of nutrition education, and more. Jim Weill, president of the Food Research and Action Center, a national anti-hunger nonprofit, brought to light the effects work requirements could have on food supplement beneficiaries. Congress passed two different farm bills earlier this year in the House and Senate, with the House version enforcing more stringent work requirements for those eligible for food service programs. The House bill would require recipients to have at least 20 hours of work or job training per week in order to retain their eligibility. Weill said we need to recognize the struggles that people are going through, and creating more bureaucratic barriers for those in need jeopardizes the lives of millions of Americans, and thousands of Marylanders. More than two-thirds of food supplement beneficiaries in Maryland are families with children, and about 30 percent are families with an elderly person or a person with a disability, according to the U.S. Department of Agriculture. The agency also found that about 43 percent of beneficiaries are in working families. All three percentages are just below the national averages. At a local level, Light House is doing exactly that. 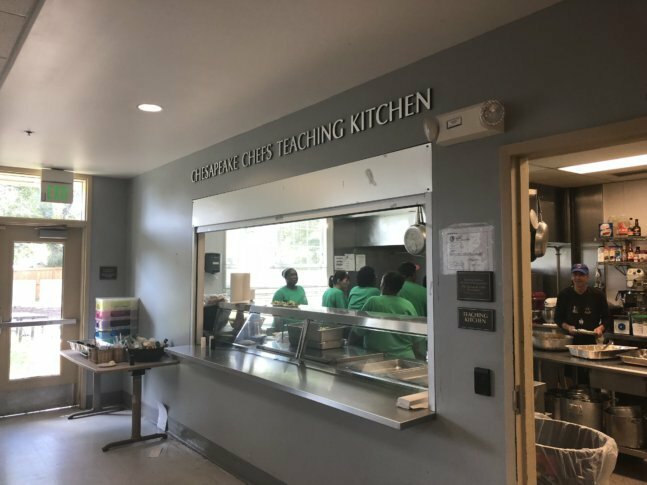 As part of its culinary program, individuals at the shelter are taught by volunteers in the kitchen for three months before being moved to the Light House Bistro a few miles away. At the bistro, the program participants are housed and given a two-month internship at the restaurant to gain real-world employment experience. The program is now in its 20th class. In the coming weeks, Light House will be undergoing construction to upgrade its storage and kitchen for an upcoming client-choice pantry that resembles that of a typical grocery store.